There I go with my love of alliteration again. But ever so slowly, it appears I’m becoming a fan of stuffed vegetables. You may remember that it was just about a year ago that I sang the praises of Sausage and Basil Stuffed Tomatoes. 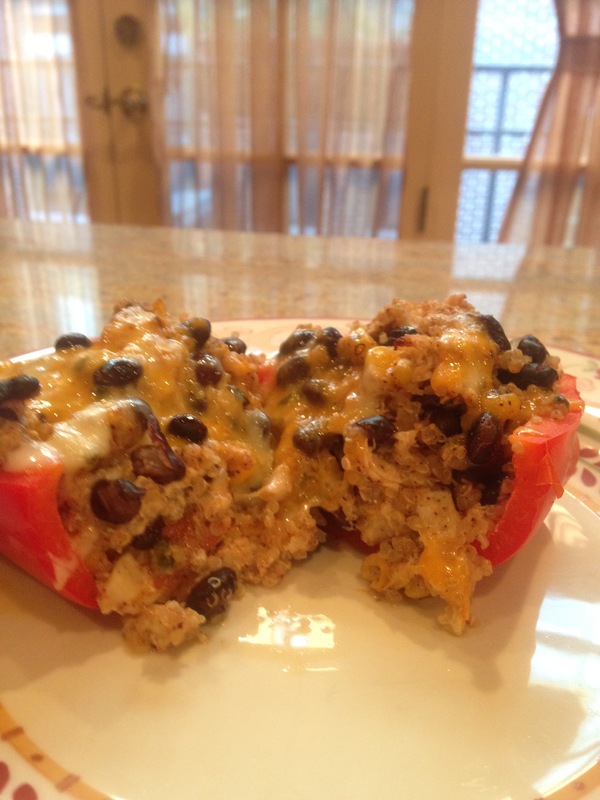 Now, I’ve found a stuffed pepper recipe that totally took me by surprise. Apparently I’m going to have to reconsider my stance on this issue. My only complaint with this recipe is its name. Chicken-Stuffed Bell Peppers with black beans and corn. Really? That’s it?? Boring!! I cannot recall where I came across this recipe, but it needs some serious rebranding! How about Fiesta-Filled Boats of Deliciousness?? OK, maybe not. But still, this dish is a fabulous blend of southwestern flavors and is relatively easy. To top it all off, it’s incredibly healthy and low-calorie thanks to the Greek yogurt and quinoa. Go ahead and treat yourself to something tasty and different by making this for dinner soon. And if you think of a better name, please let me know! Sauté jalapeño, scallion whites, and garlic in same skillet over medium-low heat until fragrant; 2-3 minutes. Deglaze skillet with lime juice. Combine beans, corn, 1/2 cup cheese, yogurt, cumin, chili powder, coriander, salt and pepper with quinoa, chicken and jalapeño mixture in a large bowl. Arrange bell peppers in a 9×13-inch baking dish; spoon filling into bell peppers. Add 2 Tbsp water to bottom of dish; cover with foil and bake 30 minutes. Remove foil; bake bell peppers until fork tender, 10-15 minutes more. Garnish bell peppers with remaining 1/4 cup cheese and scallion greens. I find that I’m quickly becoming a huge fan of miso. I realize this is in no way a new ingredient. On the contrary it’s been around for almost as long as Japanese cuisine has existed. And while I’ve certainly had miso in quite a few Asian dishes, it hasn’t been until recently that I’ve started making it a central part of sauces, marinades and toppings. It’s unctuous, salty, earthy and incredibly mellow. It just seems to disappear into whatever you put it in, while making everything else in the dish taste more cohesive. It’s magic! It’s like the perfect party mixer – everything that’s around miso just seems brighter, more savory and, well, yummier. 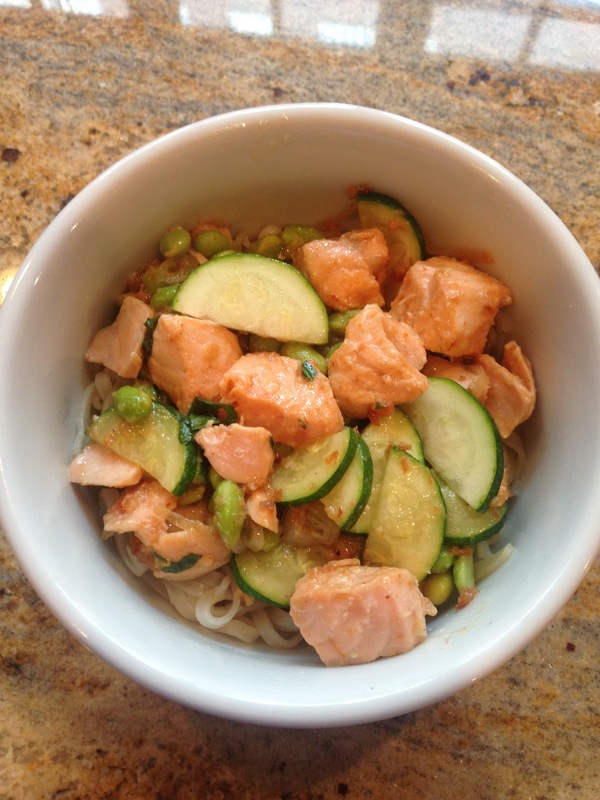 Which brings me to this week’s winner: Edamame and Salmon Stir-Fry with Miso Butter. The recipe comes from Eating Well Magazine and is incredibly easy and ridiculously healthy. The result is one of those dishes that you just keep going back for one more bite of. And why not? With all this good stuff in it go ahead and gorge! Serve over rice noodles or rice. Weekly Winner: A luscious creamy pasta rediscovered, revamped, and improved, with pork of course! I have a huge stack of recipes that I’ve made once or twice and really liked. But then others come along and take their place and the original recipes are forgotten – moved to the bottom of the stack. Out of sight, out of mind. That is until I get tired of making the new, “currently in favor” recipes and start to dig down to the bottom of said stack. This usually results in comments like “oh yeah….that was really good, I think”. It has to have been good because if it was simply “OK”, it would not have remained in my stack. I don’t have time for simply “OK”. 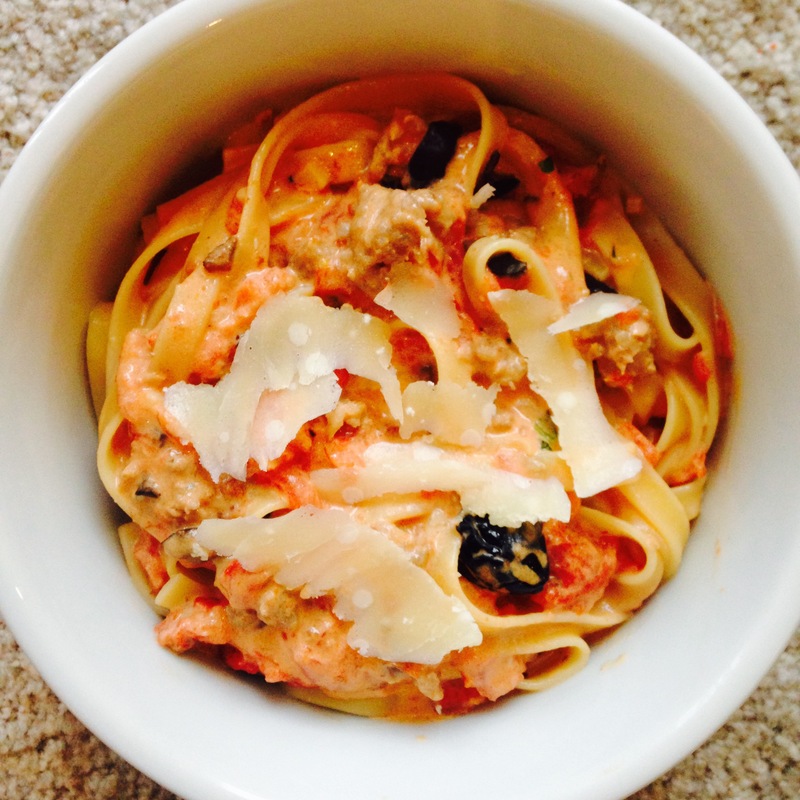 This is exactly what happened recently when I rediscovered (aka unearthed) Fettuccine with Tomato-Cream Sauce. I was looking for a Friday night pasta dish for me and hubby but we’ve been super busy and I wanted it to be quick, easy, and relatively light. (Note the emphasis on “relatively”). I remember when I first made this dish that it was better than it should be with how easy it was and how few ingredients were required. I was also looking for a chance to use up some fabulous Italian sausage I had in my fridge. Voilà! Add sausage to this pasta. Pork of any kind + pasta = perfection in my book. Turns out, I was right. The original (sans sausage) recipe comes from Cooking Light Magazine. Yes, adding the sausage ups the calorie and fat content a bit, but it is so worth it. Having said that the non-pork version is great. Just not quite as great as it is with pork. Just sayin’! Cook pasta in boiling water with 1/4 tsp salt until almost al dente. Drain pasta reserving 1-1/3 cup pasta cooking water. Stir in remaining 1/4 tsp salt and tomatoes; cook 3 minutes, stirring occasionally. Stir in remaining 1-1/3 cups pasta water; bring to a boil. Add cream cheese; stir until smooth. Add pasta, olives and red pepper; cook 3 minutes or until pasta is done, tossing to coat. Divide pasta mixture among 4 shallow bowls; top each serving with 1 Tbsp basil. Divide Parmigiano-Reggiano evenly among servings.